Oh, we have some fun things to share today. Big news on Search and Lighting and Shadows. In the latest version of SL Viewer (2.7.1) released today, we’re introducing the new Search beta as the standard search technology that helps you find interesting people, places, events, items for sale, and other things to make your inworld experience more fun, collaborative, and meaningful. Enhanced Classified Listings: You can now search classified ads in the beta. So, whether you are searching for a seller, item, or store, you’ll be able to find them quickly and easily. Sorting is a Snap in People, Places, Groups, Events, and Land: Handy sorting features are now available in several popular categories. For example, when searching for people, you can sort by either User Name or Display Name. When searching for events, you can sort by name, or by when an event is scheduled to occur. When searching for land, you can sort by name, price, area, and more. Nice, huh? And we’ll be adding more sorting options in the future! Featured Land listings: Not only are we making land listings easier to navigate, but we’ve added featured land listings to the main page. Take a look at the Land & Rentals tab on the search homepage for quick links to available properties! We’ve also added a few subtle, but helpful, usability enhancements—all based on Resident feedback. Those include going back to the check box as an option to click when searching for mature content, adding wildcard searches to the people tab (ex: rod* lin* finds Rodvik Linden), highlighting search terms in results, saving your place in search results when you reopen search, and making it easier to open and close search results. So, big thanks to those who took the time to send feedback in the Search Project Viewer. We got some terrific suggestions. SL Viewer Search is still in beta and we continue to smash bugs, tweak relevance, add features, and optimize it for international Residents. So, let us know what you think by sharing your suggestions by clicking the “Feedback” link at the top of the Search window. You might have noticed the cool log-in screen images with shadows that give them greater dimensionality and lifelike feeling. Now, you can have them too. This version of the SL Viewer introduces dynamic lighting for multiple local lighting sources, as well as high quality real-time shadows from the sun or moon. And, it’s easy to enable. In the SL Viewer’s Advanced mode, choose Me > Preferences, go to the Graphics tab, click the Advanced button, and just check Lighting and Shadows. (If your graphics card can’t support this option, then it won’t be available.) Then, you will experience the magic of Second Life like never before. For more information, see Lighting and Shadows. So, download the latest SL Viewer today and we’ll see you inworld! Save the Date! SL8B Begins on June 20th! You’re invited! Second Life’s 8th birthday (SL8B) celebration begins on Monday, June 20th and runs through Saturday, July 2nd. This year, there are 21 SL8B regions that open at 10:00 am. on Monday, June 20. There will be more than 300 exhibitors 300 live performances, and all the cake you can eat. And, did someone mention the freebies on the Marketplace? Yep, there are already free SL8B bears for everyone. We’ve got a great line up planned and you won’t want to miss a thing! Get a sneak peek of all the planning, preparation, interviews, and events on the official SL8B blog. Can’t wait for the fun? Chantal Harvey, renowned machinima artist and SL8B volunteer, gives you a taste of what’s to come. Phaylen Fairchild has created a wonderful video about the evolution, magic and imagination of SL from inception to its eight year anniversary. Both videos are well worth watching! Also, mark your calendars for Monday, June 20th when Kim Linden will give a short opening address at 11am SLT. Then on June 23rd at 3pm SLT Rodvik Linden, the CEO of Linden Lab, will be mingling with the crowd at the SL8B Main Stage. Second Life Community Convention 2011! Registration Now Open! The 7th Annual Second Life Community Convention 2011 will take place at the Oakland Marriott City Center in Oakland, CA from August 12-14, 2011, and registration is now open! Linden Lab is a sponsor of this great event that is offered to you by the amazing AvaCon organization. Read about them here! The Second Life Community Convention is three days of exciting activities, events, musical performances, machinima screenings, panels, workshops, and much more that showcases the abundant creativity of Second Life Residents. 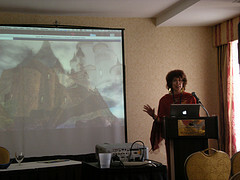 The Second Life Community Convention is more than just what is planned — the convention is also what you want to make it. Don't just attend — share something with the community! The Call for Proposals is up, and with five new track themes and fun presentation formats, you have the opportunity to share your hard work and creativity with the community that will most appreciate your efforts. Don't want to give a full presentation? Consider doing a Speed Sparks session of 20 slides in five minutes to share the gist of your idea in a fast paced presentation style that was a huge hit last year! There are a few Staff and Track Leader positions open, and if you want to help run the show on the ground in Oakland or inworld, you are invited to join the team. It's easy to ask "Why don't they do X?" but the real fun comes when you help make it happen! Apply for a Staff or Track Leader position, or be an Oakland volunteer or Inworld volunteer today! If you have a product or service and want to get your message out to the most enthusiastic Second Life Residents, or if you just want to show your support, there's no better place to spread the word than at the Second Life Community Convention. There are many levels of sponsorship, so it's more than affordable to help support this nonprofit, community produced event - become a sponsor! The convention has a light schedule on Friday, Aug. 12th to make sure there's plenty of time for socializing and networking, and to give you the opportunity to organize your own fun events. Check out the Social Events & Mixers page to organize a social event or outing for your friends and communities. Need ideas for things to do? 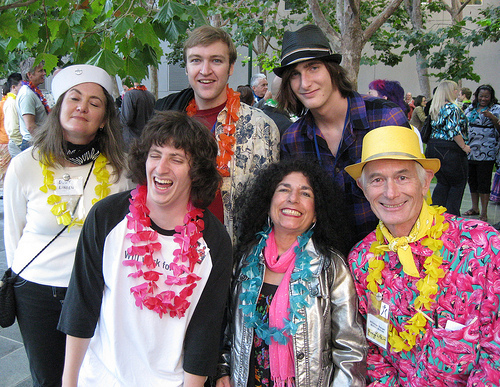 There is a terrific guide of things to do In & Around Oakland to help you get started! There has been lots of hard work this year to help keep the cost of the convention affordable, and there are a number of resources available to help you plan your trip. 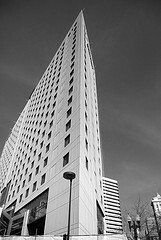 The convention will be held at the Oakland Marriott City Center in the heart of downtown Oakland, CA — just a ten minute train ride from San Francisco. 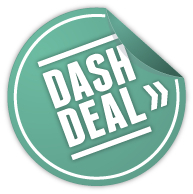 The best room rates ever have been negotiated! $109 a night for up to quad occupancy, and free wireless internet access in guest rooms. You must be registered for the convention to receive the group-rate discount, and you will receive the link to reserve your rooms in the email confirmation you receive when you register for SLCC. Note that lunch on Saturday and Sunday is included in your convention registration, as well as free wireless internet access in all convention spaces. If you need information about flying, driving, or taking the train to SLCC, check out our transportation guide to get all the details you need to get to the convention. There is also a guide to help you budget for your trip. Visit the SLCC General Budget page to see a breakdown of convention expenses, a general budget guide to help you estimate costs for travel, and tips to help reduce the overall cost of the convention. If you're interested in sharing expenses on hotel rooms or travel, you can also find information to help you coordinate Finding a Roommate or Carpool. More details will be announced soon about the program sessions and keynote speakers in the coming weeks. SLCC is going to be a fun and thrilling three days of sharing, learning, and networking with Second Life Residents from around the world! A longstanding question about the default avatars that the Lab provides is “Why do they only offer humans?” Well, fret no more! Check your Library > Clothing > Initial Outfits tab in any Viewer and you’ll be pleasantly surprised to discover 36 new default avs! We worked with three amazing creators and focused on balancing visual appeal with diversity and efficiency. We think you’ll find that this fresh batch of avis is far more performance-oriented than our previous defaults — and a heck of a lot of fun. For Residents using Basic mode, the new set of avatars will soon appear in the avatar selector. In a short time, they’ll be available at registration as well. You’ll be tempted to choose your favorite. Try out Second Life as a robot, a dragon — or even a sports car! Here’s a little something about that right royal pain, Group Chat Lag. You know how it is: you’re inworld, having a ball chatting with a group of friends, but the chat shows up with words missing or in the wrong order. It’s like a bad roommate, always hanging around and making a mess, interrupting your conversations and ruining your jokes! Some of your friends won’t even try talking while that loser’s around, knowing that their impeccable comic timing will come out looking like free-form poetry. Except, for some reason, we don’t see that dude around much these days. Was it something we did? We’re working on improved functionality and features for Profiles, a great way for you to express your interests, share your favorite activities, communicate your unique personality, and meet other SL Residents like yourself. Some of the cool things we’re adding will include a “Pages” feature that lets you add pages to your profile for different topics, interests, regions and other fun stuff. As always, you control the level of privacy for your account — you can adjust precisely how much information you choose to display — or keep private! You can look forward to a feature that will allow the option of auto-posting to Twitter and Facebook— as well as a new activity stream, including a summary of your friends’ activities. This will allow you to check out what posts or photos your Second Life Friends have commented on, notify you when a friend changes their profile pic, and more! We’re also working on integrating additional social-network identity — including popular sites like Plurk, Blogger, WordPress, Tumblr and Foursquare — so you can streamline your SL social networking, all fine-tuned to share just as much or as little as you prefer. You’re in the driver’s seat, but we’re glad to be along for the ride! For all of you who love shopping for new gadgets, outfits, avatars — and everything else under the sun! — we’ve implemented some changes to our Marketplace hat will enhance your shopping experience and make the process go more smoothly. One of the coolest features we’ve been working on is Direct Delivery. We launched the Alpha phase of Direct Delivery in early June, and the participating merchants have been giving us some great feedback! What’s next? More focus on improving Direct Delivery, and working with Beta Merchants on the Alpha platform. On the promotional email front, we’ve improved the functionality of promotional-email subscription preferences. To unsubscribe to any promotional email, just hit the “unsubscribe” link in the message, and you’ll be able to choose the type of emails you want to get from Linden Lab — instead of “all-or-nothing.” This feature allows you to opt-in to messages you’d like to see more of — and unsubscribe from those you don’t! You’ll still receive other messages, like inworld notifications and Marketplace emails. Later this month, the new Search functionality that was included in the most recent Viewer release will go live as the primary Search experience for all Residents. Every search on the Secondlife.com website and in the Legacy Viewer “All” and “Groups” categories will use the new back-end technology, and will benefit from the improved result relevance. Viewer users will not only get the updated results — they’ll also be able to take advantage of all the exciting features we've included in the new Search interface, including easier searching for Events, Land Sales and Rentals, and Classifieds. If you haven't explored Second Life with the new-and-improved Search functionality yet, download the Viewer and take a look! Let us know what you think! Share your experiences with these new features in the Technology Forum. And, don’t forget to hit Twitter — follow us @Secondlife and tweet using the hashtag #secondlife. Now, go explore Second Life, tap into your creative side — and make something incredible! 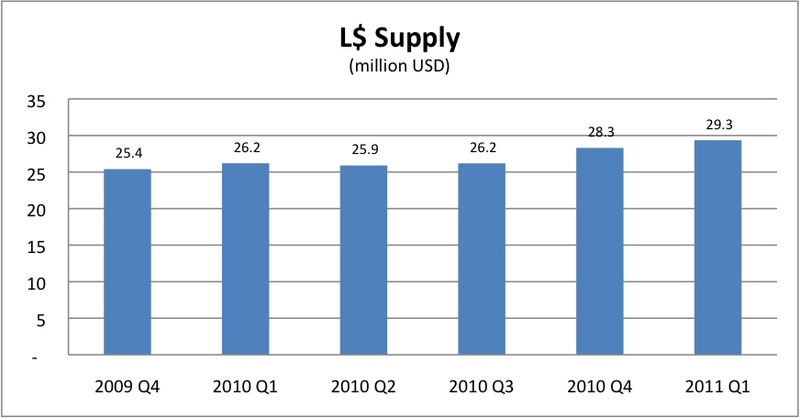 The Second Life economy remained consistent in Q2 2011. The highlights were strong growth in registrations, a steady Linden $ exchange rate with slight appreciation, and continued growth in Linden $’s held by customers –with most other key metrics within 1-2% of recent quarters. With the addition of Basic and Advanced viewer modes, plus an improved new user registration flow in early Q2, there was a sharp uptick in registrations that continued throughout the quarter. 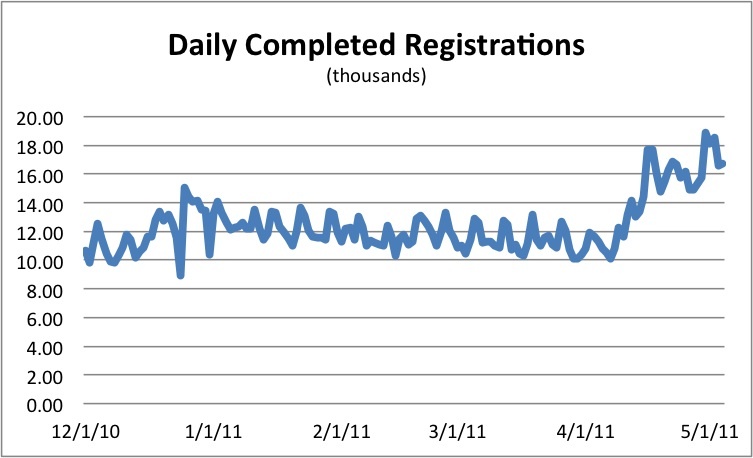 Q2 averaged 27.9% more completed registrations per day than Q1. 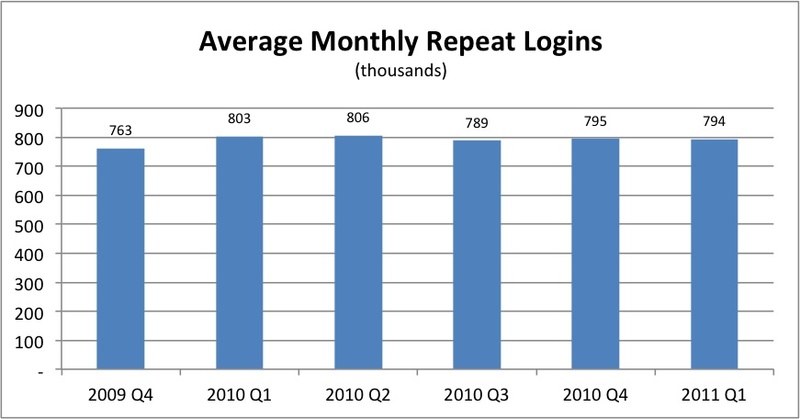 Average monthly logged-in users for Q2 increased 2.8% from Q1 2011. This chart is more comparable to industry standards for reporting size of customer base and will replace previous measures based on user repeat logins or time active. 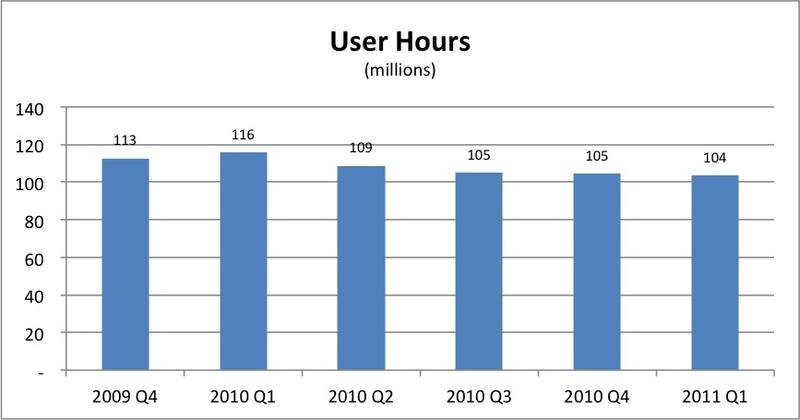 User hours remained within 2% of the most recent quarters. Active economic participants were within 1% of last quarter. 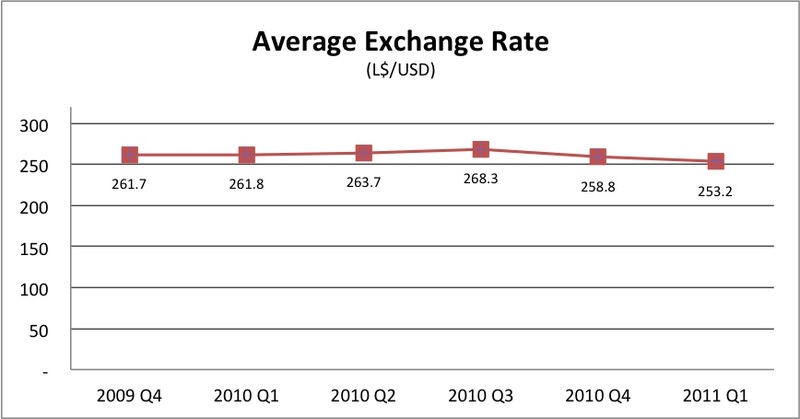 The exchange rate remains very consistent and strengthening slightly with a 0.4% appreciation in the L$ over Q1 and a 4.3% appreciation in the L$ over the same quarter last year. Money supply grew by 2.2% in Q2 from the prior quarter and 15.8% year over year, bringing the equivalent US$ value of all customer-held L$ to US$30 million. 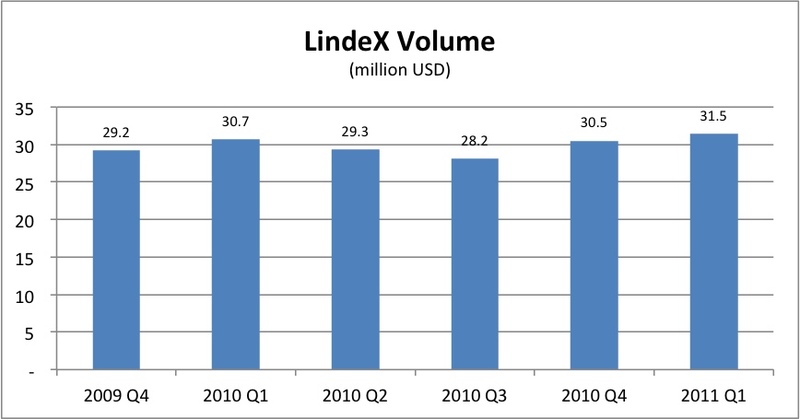 Q2 LindeX volume declined 2.7% to US$30.6 million in line with seasonality. This is a strong 4.4% increase over the same quarter last year. The volume of web merchandise sales grew by 4.9%when compared to Q1 2011 and by 38.1% when compared to Q2 2010. 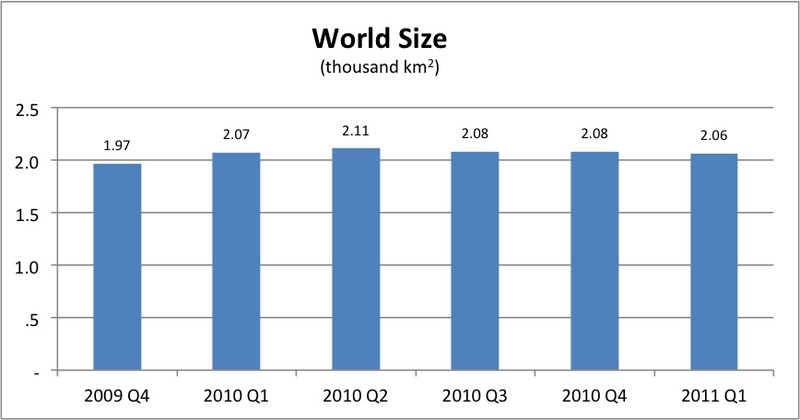 World size remained consistent with last quarter at just over two thousand square kilometers.